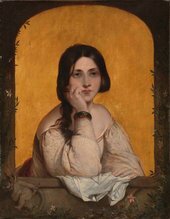 Born in London in 1810, Theodor von Holst became a student of the Royal Academy of Arts at the age of 14 and a favourite pupil of Henry Fuseli. He developed into a prolific literary painter until his untimely death from liver disease at the age of 33. Von Holst is often considered the link between early romantic British painters and the Pre-Raphaelite Brotherhood. Rossetti described him as a ‘great painter’ and considered The Bride one of his masterpieces. 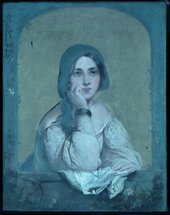 The subject of the painting is a character from Shelley’s Ginevra. She is a young Florentine bride who, forced to marry an elderly nobleman, died on her wedding day. In the painting the woman leans on a stone ledge, backlit in gold and framed by an arched window.The artist achieved the background by applying gold leaf to a priming or preparation layer on top of the canvas, adhered with an oil-based mordant. He applied the gold within the window, leaving a reserve for the figure. On top of the gold he added a reddish-brown coloured glaze to tone down the brightness of the metal leaf. Examination of the painting reveals the artist’s drawn lines beneath the semi-transparent flesh paint. These lines were used to mark features of the face, left hand and arm. They appear bluish-grey, and were probably made with a dry medium such as charcoal. Closer investigation was needed to discover more about the preliminary work the artist undertook to achieve his composition. Examination in infrared and ultraviolet light is typically used by conservators to understand better an artist’s technique and the condition of paintings. Red light penetrates further into organic materials like paint than blue light. Near infrared light, in the wavelength range just beyond the red range which the human eye can see, penetrates further still. When a painting with a thin paint layer is examined in infrared light, drawing lines made using mediums such as charcoal, Indian ink and graphite can often be revealed. A standard camera with the infrared blocking filter removed, or a more specialist camera sensitive to a broad- or adjustable - range of near infrared wavelengths can be used to record this. An infrared-sensitive digital Osiris camera uncovered at least two stages of drawing in The Bride. The first shows the face turned to the side with eyes looking out over her right shoulder. The nose, mouth, chin and curls of hair over her left cheek were also drawn. The artist chose to abandon this pose, redrawing the eyes, nose, mouth and chin a few centimetres to the right. In this second composition the eyes are focused directly out to the viewer, and it is this altered pose that von Holst went on to follow in paint. Strengthening the outlines of the initial pose on a lightened infrared image help to illustrate the changes. Near ultraviolet light, just outside the blue wavelengths which the eye can see, reveals the presence of natural resin varnishes which fluoresce naturally. When natural resin varnish has had a lot of light exposure, it appears increasingly yellow in normal light and the bluish green fluorescence in ultraviolet light is more pronounced. Examination of The Bride revealed a past campaign of partial cleaning. The flesh, white dress and draped cloth are seen to have been fully cleaned of varnish, because the fluorescent effect is absent, while the hair and background are masked beneath a cloudy bluish green coating. At present there is little visual discrepancy in normal light between areas of the painting that retain old varnish and those that are clear of it. It is likely however that a colour imbalance across the surface will need to be tackled in the future.